NOTICE: Activation key must be used on a valid Steam account. 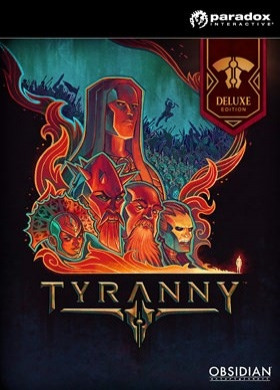 Requires internet connection.Tyranny - Deluxe Edition	Includes: Tyranny - Base Game Ringtones (three notification tones and one ringtone) Digital Original Soundtrack - The Tyranny soundtrack delivers 57 min of original music, including a total of 18 tracks. Digital High-Resolution Game Map Exclusive Coat of Arms - Adds 4 uni… que coat of arms to the Fatebinder’s selection of personalized war banners – show your allegiance with either The Disfavored, Scarlet Chorus, Tunon the Adjudicator, or Kyros the Overlord. Short Story Collection - A rich digital collection of ten short stories from the world of Tyranny, giving readers a deeper look at the brutal world and powerful characters that live under Kyros’ rule. Written by the creative team behind Tyranny, these stories introduce several of the game’s companions and key characters. This collection includes 3 exclusive tales never seen before, alongside 7 originally published on the official Tyranny website. Digital High-Resolution Wallpapers - Add your desktop to Kyros’ domain with a selection of high-quality artwork from Tyranny, sized for PC desktops in high resolution. The collection includes ten different pieces from the Tyranny art team, including one signed by the developers. Digital Collector’s Guide Book - Discover the lore and secrets of Tyranny in a comprehensive world guide from author John Helfers. Explore artwork from the game alongside the stories of the people and places of the Tiers, and discover the world that Kyros has brought to heel. Includes a foreword from Obsidian Entertainment. Digital Art Book - Immerse yourself in the war-torn world of Tyranny in an extensive collection of original artwork. About the game	In Tyranny, the grand war between good and evil is over – and the forces of evil, led by Kyros the Overlord, have won. The Overlord’s merciless armies dominate the face of the world, and its denizens must find their new roles within the war-torn realm... even as discord begins to rumble among the ranks of Kyros’ most powerful Archons.Players will experience the new world order under Overlord in a reactive role-playing game (RPG), interacting with the populace as a powerful Fatebinder in the Overlord’s forces -- roaming the lands to inspire loyalty or fear as they bring control to the last holdouts of the Tiers. Key features	Branching, unique stories in an original setting: The battle between good and evil has already taken place, and evil stands victoriousChoices matter – make world-altering decisions with far-reaching consequence: As a Fatebinder in the Overlord’s army you wield a vast amount of power in the occupied lands of the Tiers. Will you use that to inspire stability and loyalty, will you be feared, or will you seek your own power?Challenging, classic RPG combat: Tactical real-time-with-pause combat with new party-driven mechanics and modern presentationA rich original setting: Not just another “hero’s journey” -- Tyranny turns the archetypal RPG story on its head and allows players to explore a new take on good and evil System Requirements Windows - MinimumOS: Windows 7 64-bit or newer Processor: Intel Core 2 Quad Q9505 @ 2.80 GHz / AMD Athlon II X4 840 @ 3.10 GHzMemory: 4 GB RAMGraphics: ATI Radeon HD 5770 or NVIDIA GeForce GTS450 with 1GB VRAMDirectX Version: 9.0cDisk Space: 15 GB available spaceSound Card: DirectX Compatible Sound Card	Windows - RecommendedOS: Windows 7 64-bit or newer Processor: Intel Core i3-2100 @ 3.10 GHz / AMD Phenom II X4 955 @ 3.10 GHzMemory: 4 GB RAM or moreGraphics: Radeon HD 6850 or NVIDIA GeForce GTX 560 with 1GB VRAMDirectX Version: 9.0cDisk Space: 15 GB available spaceSound Card: DirectX Compatible Sound Card	Mac - MinimumOS: Mac OSX 10.10Processor: Intel Core i5 @ 2.9 GHz Memory: 4 GB RAMGraphics: Radeon HD 6950m with 1GB VRAMDisk Space: 15 GB available space	Mac - RecommendedOS: Mac OSX 10.11 Processor: Intel Core i5 @ 2.9 GHz Memory: 8 GB RAMGraphics: AMD R9 390m or NVIDIA GeForce GTX 750m Disk Space: 15 GB available spaceLinux - MinimumOS: 14.04 LTS Processor: Intel Core 2 Quad Q9505 @ 2.80 GHz / AMD Athlon II X4 840 @ 3.10 GHzMemory: 4 GB RAMGraphics: ATI Radeon HD 5770 or NVIDIA GeForce GTS450 with 1GB VRAMDisk Space: 15 GB available spaceLinux - RecommendedOS: 14.04 LTS Processor: Intel Core i3-2100 @ 3.10 GHz / AMD Phenom II X4 955 @ 3.10 GHzMemory: 4 GB RAM or moreGraphics: Radeon HD 6850 or NVIDIA GeForce GTX 560 with 1GB VRAMDisk Space: 15 GB available space © 2016 Paradox Interactive®. Trademarks belong to their respective owners. All rights reserved.